Jose Manuel Delgado Mendoza @ HIFIlive! We would like to congratulate Tune Audio with partners from Trafomatic Audio, Rockna Audio and Skogrand Cables for winning our Cupiditas award for the most desired system during the 2018 High End Society Munich show. Tune Audio with its horn system Anima is already an old acquaintance of the fair in Munich, but this time the reference presentation relates more to the great stricken partner Mood Wright accompanied by the sound system was emphasized faster, more transparent and with much more discipline. 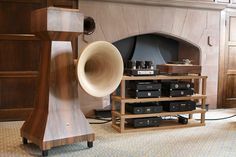 They don’t come much bigger or hornier than the Tune Audio Anima loudspeakers, they have sounded amazing whenever we have heard them but this year, paired with Modwright electronics, Skogrand cables and a VPI turntable they were very special…yes they are big, but why not if you have the room! Dynamics, scale and sheer musicality were the order of the day in this room. 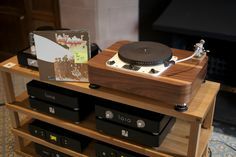 ModWright collaborated again with Tune Audio and also VPI. The Greek hornspeakers benefited from newly designed tower subwoofers. Dan Wright had brought both phono and digital to support a VPI table and streaming MacBook. During my second visit on Saturday, the sound here was very good and actually eclipsed last year’s. These Tune Audio horns are fantastic. So are these electronics. If someone little tub, go ahead – Tune Auio Anima supported, by the horn subwoofer driven by Pulse famous for its musicality and recognizable design electronics Mod Wrigta could shake half of the exhibition. Apparently KWA 150 Signature does not belong to giants, but with the columns of the effectiveness of 109 dB when you turn on the AC / DC converter generates offered truly stadium volume levels and perhaps only by “marine ropes” Signal Projects system did not remove himself from the ground. Word Avantgarde are worthy opponent and considering that the aforementioned. system offered not only hellish power, but finesse, the result of such a duel would many a surprise. It’s likely that the massive ModWright transistor amp overdamped his light-membrane drivers with their powerful motors a bit. Knowing what the Anima were capable of, I wasn’t troubled. This still was very fine musical and very meaty sound like Boenicke and soundkaos, simply scaled up for a bigger space. It only lacked ultimate resolution and airiness (i.e. some ‘hifi sound’ qualities which one ultimately hopes to clone atop the mandatory musical foundation of tone mass and dynamics). Dan Wright’s gear of course was dead quiet into these noise-tracking transducers to credit his consummate design chops. 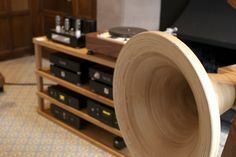 Tune-Audio is your Anima horns, and Pulse Subwoofer very successfully weaves with ModWright Instruments electronics. Speed, openness and frightening natural stage adorned sound. Certainly the best edition of Anima that I have had the opportunity to experience. Relatively new to me were the 32k Tune Audio Anima horn-loaded loudspeakers driven by the Lars II amp. The Animas were coupled to a huge 15k downward-firing, horn-loaded Anima subwoofer that blended very well with the main speakers. The system sounded fantastic on concert grand – very natural with superb timbre and scale. It was also sensational on trumpet, choir, and organ. Indeed, the new Avantgardes aside (I couldn’t get in to hear them – the room was that crowded! 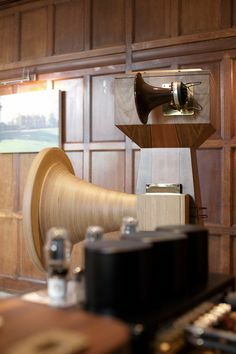 ), these may be the best horn speaker I’ve ever heard! They were certainly BOS contenders. …was in my opinion one of the most interesting alliances of the show. 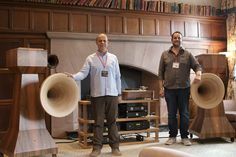 I was very impressed with the sound of Tune Audio’s Anima (32k), three way fully horn loaded loudspeakers from Greece; they produced an open, dynamic and uncompressed sound that was naturally presented much like live music. Eye Candy! The highly efficient Tune Audio Anima horn loudspeakers (109 dB) of Greece, and their new actively driven sub nicknamed the “Pulse” were driven by a pair of Aries Cerat huge mono amps to impressive results. No, I didn’t get the chance to listen at length this year due to this room being so overly busy. But from the short time spent, I could tell there was a lot to like in these outlandishly designed components. Tune Audio showed their Anima 3-way horns with active Pulse horn-loaded subwoofer. Electronics were by Aries Cerat. This was my favorite system by far. It was wildly impractical and desirous of space and funds I don’t have of course. But that’s the fun of attending shows. One makes encounters of the 4th kind which, though short-lived, confirm what’s achievable to reset personal goals at home. I’d been impressed with Tune Audio already at their first showing during the Athen hifi show. In a rather larger space in Munich this first impression merely compounded. Best Sound of the Show? From what I heard -which was a small fraction- absolutely. I’ve auditioned the Aries Cerat Exsequor Reference tube amplifier paring with Tuneaudio horn speakers; the sound is extreme clean, transparent and dynamic. Another of our favorite heart. Strength. Matter, grain rendering. 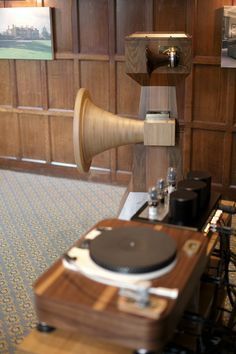 Tune Audio horn and electronic Cerat Aries: the Palme d’Or in the presentation esoteric, but also for musical performances of the highest quality. Tune Audio Anima horn (right) combined with Aries Cerat amplification was entirely beside the best in the show. The Anima from Greek manufacturer Tune Audio driven by Cosmos tube amps from the same stable, managed to overcome many of the limitations of its location to make very agreeable sounds. The Anima claimed to be mechanically time-aligned, certainly sounded more coherent than many. In my opinion was the best sound of the show.